So I Got This Card…And Now I’m Here… | Half Heart. Whole Life. ← So What Do I Pack? Hi There! Did you receive this card recently? 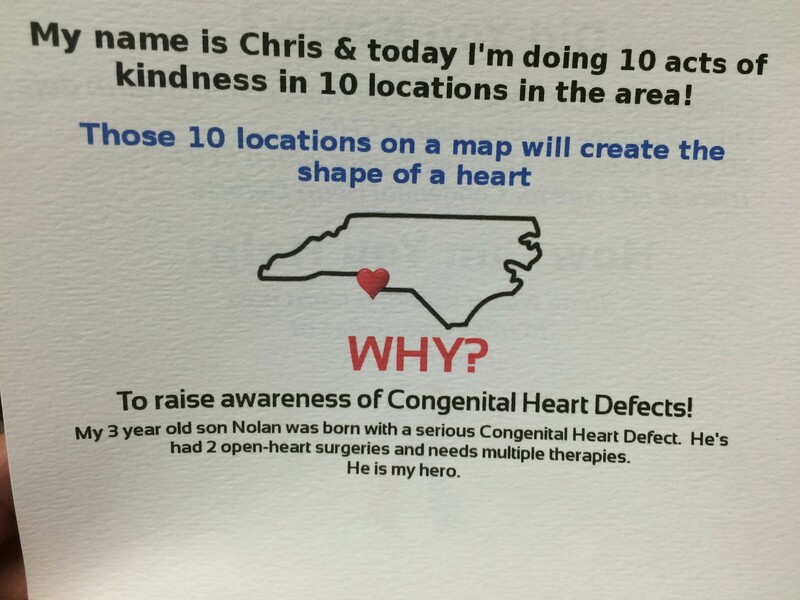 That means you were a recipient of one of my acts of kindness for Congenital Heart Defect Awareness Week! I really appreciate you taking the time to visit this blog and learn about my son Nolan’s story. I encourage you to take a little bit of time and read through the posts on here. Tell others about those facts that are on the back of your card. CHDs are the most common birth defect. There is no cure. Make some noise! You can write to your mayor, governor, city council, or even local lawmaker to tell them about the act of kindness you received and that you want to make them aware of Congenital Heart Defects! The reality is that we still don’t know the cause of CHDs and it’s going to take a lot of research and money to find that out. Call, write, and email to your representative and ask them to support Congenital Heart Defect research. Learn more facts! The Pediatric Congenital Heart Association has a great CHD fact sheet: read it here. Send your prayers and kind thoughts: there are lots of kids like Nolan out there who need all the prayers and positive thoughts they can get. They are going through lots of scary things and so are their families. They can use your support, even if they don’t know you’re sending it! Support a cause, if you wish. There are two great ways to support organizations that help kids with congenital heart defects. The first is Levine Children’s Hospital, where most local heart kids receive their life-saving care. If you ever want to donate to them you can do so here. Another great organization close to our heart is Camp LUCK, which provides support for kids and families as well as a medically-supervised overnight camp for kids with CHDs. They do AMAZING work and you can learn more about them here. Continue to follow Nolan’s story. I update this blog pretty regularly and also try to post pictures and videos on his Facebook page. Nolan is one tough kid and he has been through so much and is full of lots of love and laughs. 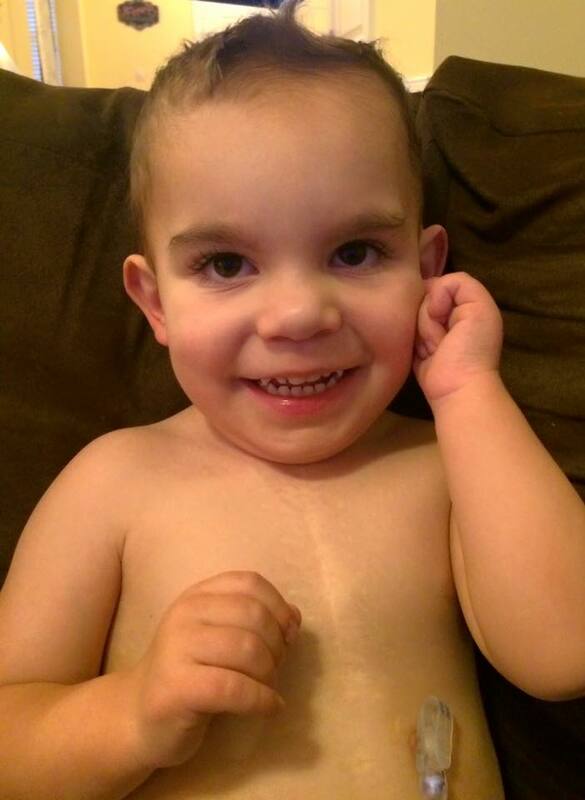 He will be going in for his third open-heart surgery this spring: if you could send him some love through kind messages in the comments section on this blog or on Facebook, that would be awesome! Thanks again for taking the time to visit. I hope you’ve learned something about CHDs today and I hope you know that not only is it important to me, but it affects thousands of kids and families across the country. You can keep making a difference by helping us make people more aware. Finally, I wanted to share a picture of my sweet little Nolan…he’s an amazing boy. My hero doesn’t wear a cape, he rocks a scar! Posted on February 10, 2016, in awareness. Bookmark the permalink. Leave a comment.